The Irish Gift House is proud to announce that we have just given our Guinness gifts category a complete makeover that includes updated product images and better descriptions. Naturally we couldn't help adding some new items such the latest Guinness Christmas ornament and a Guinness t-shirt. Some of the earliest items we ever added to our site, TheIrishGiftHouse.com, were several pieces of Guinness merchandise with one being a Guinness pouring spoon. These branded pouring spoons will assist you in concocting a black and tan or a half and half; you simply pour the black stuff over the back of the spoon so that it fans out over your ale in the former and your larger in the latter. You may also wish to use your pouring spoon to create a drink called a black velvet which starts off with champagne. Most however just order a pint of the plain and your best bet is to use a tulip shaped Guinness glass. The tulip shaped glass is wider toward the top and the benefit of this shape is to allow the nitrogen bubbles to travel from the bottom and return to the top and create the famous creamy head. The Irish Gift House offers a varied assortment of 20 ounce Irish beer glasses and Irish coat of arms barware that are perfect way for you to imbibe this ebony nectar from Ireland. Another classic vessel for enjoying your stout is from one of our Celtic tankards, but don't miss browsing our crystal tankards from Galway Crystal or our pewter tankards from Mullingar Pewter. The iconic stout has a loyal following and these ardent enthusiasts appreciate Guinness merchandise because they evokes pleasant experiences of drinking Ireland's most famous dark beer. We have dozens of thoughtful Guinness gifts that you will be pleased to give and receive that range from an apron to several bottle openers. For the man cave or the home pub we have a selection of Guinness bar signs that include several that are made of wood. 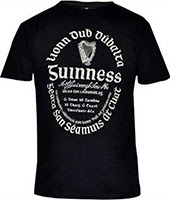 Additional considerations include the Guinness rugby shirts that are woven in a traditional fashion that is suitable for game day and the assortment of Guinness polo shirts are perfect for a round of golf or for casual wear. So go ahead and treat yourself to any of our Guinness gifts. You are encouraged to drink responsibly, but we urge you to browse our site with abandon.